Malaysia adopts a ‘dual banking system’ policy in which its Islamic finance industry operates on a parallel basis with its conventional counter­parts within a fundamentally similar financial infrastructure. Islamic finance products are regulated differently from the conventional instruments as Islamic finance products are heavily scrutinised and screened by shariah scholars or committees to ensure that they reflect the true nature of the shariah principles that they represent. The dual banking system model has led to the enactment of the Financial Services Act 2013 (FSA) and the Islamic Financial Services Act 2013 (IFSA). Both the FSA and the IFSA took effect on 30 June 2013. The FSA repealed and consolidated the provisions of the Banking and Financial Institutions Act 1989, Exchange Control Act 1953, Insurance Act 1996 and Payment Systems Act 2003, in order to streamline the regulatory structure of the financial sector in Malaysia. The FSA enhanced the powers of the Central Bank of Malaysia (BNM) in order to provide the much needed oversight of the money market and foreign exchange market with a view to promoting financial stability. The FSA provides regulation and supervision of among others, financial institutions, operators of payment systems, issuers of designated payment instruments and insurers. The IFSA repealed and consolidated the Islamic Banking Act 1983 and Takaful Act 1984. It sets out extensively a legal framework governing the Islamic financial institutions, operators of payment systems, issuers of designated Islamic payment instruments and takaful operators. One of the IFSA’s principal regulatory objectives is to promote compliance with shariah. The IFSA has made it mandatory that each licensed person establishes an internal shariah committee for the purpose of ensuring that the business, affairs and activities of the licensed person comply with shariah requirements at all times. Islamic finance is very well established in Malaysia. Under the Interest Free Banking Scheme introduced by the BNM in 1993 (which was later changed to the Islamic Banking Scheme), conventional banks were permitted to establish Islamic windows to provide Islamic banking business leveraging on their existing infrastructure and branches. Banks participating in the Islamic Banking Scheme were required to set up an Islamic Banking Division at their head office to oversee the overall operations of the Islamic windows. The Islamic windows approach received wide acceptance and significantly increased the conventional banks’ participation in the Islamic banking industry, which subsequently led to the BNM’s call for the establishment of ‘Islamic subsidiaries’ aimed at providing greater focus, resources, autonomy and governance for Islamic financial institutions. As a matter of policy, conventional banks were encouraged to subsequently convert the Islamic windows into Islamic subsidiaries, operating under the auspices of a separate Islamic banking licence and regulatory framework. As an alternative, licensed institutions such as commercial banks and investment banks are also permitted to conduct a wide range of Islamic banking business (in international currencies other than Malaysian ringgit), through the establishment of an International Currency Business Unit (ICBU). An ICBU is required to establish a dedicated division headed by a senior management officer to carry out Islamic banking business in international currencies of the ICBU. The division is required to also maintain separate accounts from the Malaysian ringgit transactions of the entity. To ensure that the Islamic banking activities conducted through the ICBU are shariah-compliant, the ICBU of a commercial bank and an investment bank may leverage on the shariah committee established by the entity at a group level, or engage the service of external shariah advisers. Islamic funds and Islamic products are widely offered by financial institutions in Malaysia. Conventional financiers also offer a wide range of investment options in businesses dealing with goods and services that are considered sinful (haram). There have been listings of sukuk on local exchanges. Based on the statistics published by the Securities Commission (SC), as of 31 December 2017 there are 47 sukuk programmes currently listed on Bursa Malaysia. The main legislation governing Islamic banking and insurance (takaful) is the IFSA. The IFSA imposes an express obligation on a licensed institution to ensure at all times that its aims and operations, business, affairs and activities are in compliance with shariah. An internal shariah committee is tasked to ensure this objective is achieved. The BNM is empowered under the IFSA to specify standards and issue guidelines on shariah matters. The BNM has issued a Shariah Governance Framework for Islamic financial institutions laying down the fundamental principles upon which an Islamic financial institution and takaful operator should organise and arrange its shariah governance structure. The IFSA contains substantially similar provisions to those in the FSA, such as those relating to governance and prudential matters, business conduct and consumer protection, as well as ownership, control and transfer of business. This lays the foundation in reshaping the financial landscape of Malaysia where the Islamic banks and the takaful operators are able to compete with its conventional counterparts on a level playing field. The Islamic capital market in Malaysia falls under the ambit of the Capital Markets and Services Act 2007 (CMSA), which is administered by the SC. Any person carrying on a business in any ‘regulated activity’, namely dealing in securities, dealing in derivatives, fund management, advising on corporate finance, investment advice, financial planning and dealing in private retirement schemes, needs to be licensed unless he or she is a registered person. In addition, the CMSA covers among others, provisions relating to the offering and issue of securities, market misconduct and insider trading. In discharging its duty, the SC is assisted by the Shariah Advisory Council (SCSAC) established under the Securities Commission Malaysia Act 1993 as the principal authority to ascertain the application of shariah principles for the purpose of Islamic capital market businesses or transactions. The CMSA expressly states that the courts or the arbitrators shall take into consideration any rulings published by the SCSAC for proceedings relating to Islamic capital market business or transactions, and such rulings are binding on the courts or arbitrators. In the event that the rulings made by the SCSAC contravene the rulings made by the registered shariah adviser engaged for Islamic capital market business or transactions, the rulings made by the SCSAC shall prevail. The SCSAC has issued shariah resolutions on various shariah concepts, Islamic capital market products and related issues, in line with the robust growth of the Islamic capital market in Malaysia. To better facilitate Islamic capital market transactions, an electronic commodity trading platform, namely the Bursa Suq Al-Sila’, was established to provide an additional avenue where the Islamic financial institutions may source shariah-compliant commodities to effect financings which are based on the principle of commodity murabahah. Currently, there are four commodities (which have been approved by SCSAC) being traded or made available for trading on the platform, namely: crude palm oil; plastic resin; refined, bleached and deodorised palm olein; and timber. The Federal Territory of Labuan has been designated as an International Business and Financial Centre (IBFC) to complement the financial services sector in Malaysia through its robust regulatory and supervisory framework, which is in compliance with international standards and practices, and a simple and attractive tax system. The Islamic financial services and securities industry in Labuan IBFC is governed by the Labuan Islamic Financial Services and Securities Act 2010 (LIFSSA) and administered by the Labuan Financial Services Authority (LFSA). The LIFSSA sets out, among others, a licensing framework for those providing investment advice or administrative services for the purposes of investment, Islamic banking business and takaful operators. Similar to the IFSA, the LIFSSA imposes an express obligation on a licensed and regulated entity to establish a shariah advisory board or appoint a qualified person as a shariah adviser, in order to ensure that its business activities are in compliance with shariah principles. It is worthwhile to note that the LIFSSA contains provisions regarding the establishment of new types of legal entities such as the Islamic private and public funds, Islamic trusts, Islamic foundations, Islamic limited partnerships and Islamic limited liability partnerships. The BNM is the principal authority charged with the oversight of banking and insurance products, while the capital markets fall under the purview of the SC. The LFSA is the principal authority charged with the oversight of the financial sector in Labuan IBFC. The BNM advocates a ‘two-tier’ shariah governance structure made up of a centralised shariah advisory body (ie, the Shariah Advisory Council (SAC) established under the Central Bank of Malaysia Act 2009 (CBA)) and the internal shariah committee formed under the IFSA. Should there be any contradiction between rulings made by the shariah committee and the SAC, the rulings of the SAC prevail. This reinforces the rule that the SAC is the highest shariah authority in Islamic finance in Malaysia for the ascertainment of Islamic law in Islamic financial business. The courts or the arbitrators are also required to take into consideration any rulings published by the SAC for proceedings relating to Islamic financial business, and such rulings are binding. Yes, the SAC established by the BNM under the CBA is the central authority for ensuring that transactions or financial products for Islamic banking and takaful industry are shariah-compliant. The SCSAC established by the SC under the CMSA is the principal authority for ensuring that the Islamic capital market businesses or transactions are shariah-compliant. It is a mandatory requirement under the IFSA that the Islamic financial institutions (IFIs) set up an internal shariah committee. Third parties, related parties or fund sponsors may be engaged to provide supervisory board services, subject to the relevant regulatory approvals. Yes, under the IFSA, no person shall be appointed or accept the appointment as a member of the shariah committee unless such person obtains the approval of the BNM. Such person must also fulfil the ‘fit and proper’ criteria and such other conditions as may be imposed by the BNM. Islamic banks must have a valid licence under the IFSA. In addition, Islamic banks are also required to comply with all the guidelines, circulars or directives issued by the BNM or the SC, as the case may be, from time to time. the reputation of the applicant for being operated in a manner consistent with the standards of good governance and integrity. The BNM imposes various conditions on institutions licensed under the IFSA, such as the requirement to maintain minimum capital funds or surplus of assets over liabilities. There is also a mandatory requirement to put in place a capital adequacy and financial reporting framework which is in compliance with the standards prescribed by the BNM. With respect to Islamic capital market services, such business activities are regulated under the CMSA. Domestic and foreign Islamic banks licensed under the IFSA are permitted to carry out certain regulated activities such as dealing in securities, providing corporate finance advice, providing investment advice and fund management. However, the scope of these services is limited to those provided for under Schedule 4 of the CMSA. the foreign institution may carry on such regulated activity through its collaboration with a non-related corporation that is a CMSL holder. The takaful and retakaful operators must have a valid licence under the IFSA to gain admission to do business in Malaysia. Foreign takaful operators can carry on takaful business in Malaysia with a valid licence under the IFSA. Alternatively, if a foreign takaful operator’s business matches the description of licensed business under the IFSA, it may establish a representative office (RO) in Malaysia to carry out a list of permissible activities as prescribed by the BNM, such as to undertake research, collection and analysis of important market information or feasibility studies on investment and business opportunities in Malaysia. In assessing an RO application, the BNM shall consider various factors such as the applicant’s financial position and reputation and its potential contribution in Malaysia. Foreign takaful or retakaful operators are not permitted to carry on business in Malaysia as non-admitted (unlicensed) insurers. No fronting is allowed in Malaysia. Yes. The BNM and the SC issue guidelines from time to time specifying specific disclosure or reporting requirements for takaful, sukuk and Islamic funds. Takaful operators are required to disclose to the BNM information on its policies and procedures for managing product risks including specific information on its IT system. There are also specific financial reporting requirements imposed on takaful operators under the IFSA and BNM guidelines to ensure that the financial statements of takaful operators are prepared based on the standards set by the Malaysian Financial Reporting Standards. Sukuk issuers are required to comply with the Lodge and Launch Framework issued by the SC, which require disclosure of various information relating to the sukuk, such as the shariah principles used and the utilisation of the proceeds. The SC has issued various guidelines relating to funds management, and there are specific reporting requirements which are also applicable to Islamic funds, which include disclosure of information relating to the assets under management, details of breaches of securities laws and regulations and steps taken to remedy and prevent such breaches, and the shariah governance framework in place. The IFSA imposes an express obligation on the licensed institution to ensure that its aims, operations, business, affairs and activities are in compliance with shariah. If the licensed institution has falsely marketed its financial products as shariah-compliant, it shall, on conviction be liable to imprisonment for a term not exceeding eight years or a fine not exceeding 25 million Malaysian ringgit or both. Under the CMSA, such an offence is punishable with imprisonment for a term not exceeding 10 years or a fine not exceeding 3 million Malaysian ringgit or both. The civil courts have jurisdiction to hear Islamic finance disputes. Alternatively, the contracting parties can opt to settle their disputes by arbitration. The Asian International Arbitration Centre (previously known as the Kuala Lumpur Regional Centre for Arbitration) provides specific rules relating to Islamic banking and financial services transactions. As part of its efforts to ensure that the practices and procedures adopted by market players conform to shariah standards, the BNM is responsible for, and issues from time to time policy documents setting out various ‘standards’ (ie, requirements that must be complied with by licensed institutions where failure to comply may result in enforcement action being taken), and ‘guidance notes’ (ie, recommendations intended to promote common understanding and sound industry practice which are encouraged to be adopted). The policy documents issued by the BNM were in respect of various Islamic principles including mudarabah, murabahah, musharakah, ijarah and wadiah. Under the Guidelines on Unlisted Capital Market Products under the Lodge and Launch Framework issued by the SC on 9 March 2015 (revised on 16 January 2017), the SC explicitly recognises mudarabah, murabahah, musharakah, ijarah and wadiah as one of the approved shariah principles and concepts for unlisted capital market products. The BNM issued a policy document in April 2015 to provide reference on the shariah rulings associated with mudarabah and set out key operational requirements with regard to the implementation of mudarabah, such as governance and oversight, structuring, risk management and financial reporting. The BNM recognises two types of mudarabah: the unrestricted mudarabah, which permits the mudarib to manage the mudarabah capital without any specific restrictions; and the restricted mudarabah, where the rab-al-mal imposes specific restrictions on the mudarabah terms. In a mudarabah contract, profit is shared between a rab-al-mal and a mudarib based on a ratio mutually agreed between them. Loss, if any, is borne by a rab-al-mal up to the capital value. A mudarib shall not be liable for any impairment of asset unless such loss is due to its misconduct, negligence or breach of specified terms of the contract. A mudarib is not permitted to guarantee the capital or the profit. However, the rab-al-mal may request collateral from the mudarib, which can only be enforced in the event of the mudarib’s misconduct, negligence or breach of terms of the contract. The mudarabah contract is widely used in structuring products that are classified as investment accounts. Under the IFSA, the investment account is distinguished from an Islamic deposit and is defined as an account under which money is paid and accepted for the purposes of investment in accordance with shariah principles on terms that there is no express or implied obligations to repay the money in full. The BNM issued a policy document on investment accounts in October 2017 setting out specific requirements on the structuring, risk management and market conduct of investment accounts, and the oversight requirements over the management of investment account funds and investment assets. In venture capital funding, an Islamic financial institution may share both profit and risk in a participatory arrangement provided that the investors are fully informed of all the risks inherent in such venture. The policy document issued by the BNM in December 2013 recognised both the murabahah contract and murabahah to the purchase orderer arrangement (MPO). Murabahah is expressly defined as a sale and purchase of an asset where the acquisition cost and mark-up are disclosed to the purchaser. The MPO is defined as an arrangement whereby the purchase orderer promises to purchase an identified and specified asset from a seller on murabahah terms upon the latter’s acquisition of the asset. Pursuant to the policy document, a bank may buy an asset and resell it at a profit, while allowing the buyer to settle the bank’s selling price on a cash or deferred (instalment) basis. The bank can also ask for collateral to secure the purchaser’s payment obligations. Based on the policy document, the collateral must be a shariah-compliant asset, although an interest-bearing debt-based asset such as conventional fixed deposit certificates may be used as collateral provided that it is valued up to the principal amount. In November 2015, the BNM issued a policy document on tawarruq recognising the concept of tawarruq in the provision of finance via two sale and purchase contracts. The first involves the sale of an asset by a seller to a purchaser on a deferred basis. Subsequently, the purchaser of the first sale will sell the same asset to a third party on a cash and spot basis. The concept of tawarruq is widely used in structuring sukuk in Malaysia, whereby the underlying assets are generally the commodity sourced from the commodity trading platform, Bursa Suq Al-Sila’. See question 3 for more information on Bursa Suq Al-Sila’. In terms of the tax implications, any gains or profits received and expenses incurred pursuant to the disposal of an asset by or to a person, pursuant to a scheme of financing approved by the SC are exempted from tax provided that the scheme is in accordance with the principles of shariah and such disposal is required for the purpose of complying with those principles. contractual partnership (shirkah al-aqd), whereby a partner is an agent of the other partner and the conduct of one partner in the ordinary course of business represents the partnership. A musharakah venture may be managed by a single managing partner, or by a third-party manager. There are no formalities for the appointment of the managing partner. The profit sharing ratio in the musharakah must be proportionate to each partner’s contribution unless mutually agreed otherwise. The musharakah contract is not permitted to stipulate a fixed amount of profit to any partners. The expected return in the form of a percentage that is attributable to the capital amount is only permissible in indicative form. As such, no floating rates of return can be linked to a customer’s profit unless it is used as a benchmark for indicative return. The concept of musharakah mutanaqisah (diminishing musha­rakah) is also widely used in structuring sukuk in Malaysia. Under this principle, a musharakah is entered into by two or more parties on a particular asset or venture that allows one of the partners to gradually acquire the shareholding of the other partner through an agreed redemption method during the subsistence of the musharakah contract. The BNM issued a policy document in June 2018 on ijarah, which is set to come into force on 1 August 2018. The policy document explicitly recognises that an Islamic financial institution can make available or transfer the usufruct of an asset to another person for a fixed period in exchange for a specified consideration. Ijarah contracts are not caught by the general consumer law for hire purchase. Notwithstanding this, in order to ensure that a customer under an ijarah financing contract is accorded with the same standard of protection provided under the hire purchase laws in the event of a repossession, the policy document issued by BNM incorporates requirements to ensure that the consumer protection elements in the hire purchase laws relating to repossession are reflected in an ijarah financing contract. The BNM issued a policy document in August 2016 on wadiah, which is set to come into force on 31 July 2018. Based on the policy document, wadiah refers to a contract where an asset is placed with another party for safekeeping. As such, the wadiah asset is held on trust by the custodian, for the benefit of the depositor. The custodian will not be liable for any loss or damages to the wadiah asset, except for that arising from his or her own misconduct, negligence or breach of specified terms of the wadiah contact. In Malaysia, most of the banks offer savings accounts based on the concept of wadiah. Gifts (hibah) to depositors are possible in lieu of interest, except for investment accounts. In cases where the manager or custodian breaches its fiduciary duty or misuses the funds, he or she would be liable to return in full all the depositors’ money. Based on the policy document issued by the BNM, unlike Islamic deposits, a deposit protection scheme does not extend to cover investment accounts that are based on the concept of risk- and profit-sharing. It is common for sukuk or other Islamic securities to be structured and issued in Malaysia to comply with Islamic principles, such as the prohibition of interest. The most popular and well-accepted sukuk structures are those based upon the principles of commodity murabahah (tawarruq), wakalah and musharakah mutanaqisah (diminishing musharakah). In terms of market size, based on the statistics published by the SC, there were 47 approved sukuk issuances where sukuk with a nominal value of 94.15 billion Malaysian ringgit was issued, representing 50.11 per cent of the total new corporate bonds and sukuk issuances in 2017. Generally, sukuk holders are treated as the same as conventional bondholders in an insolvency or a restructuring (ie, as debt instruments). However, sukuk are viewed as trust certificates (ie, documents evidencing ownership of assets). Having said that, we are not aware of any Malaysian court decision or legislation declaring that sukuk holders are deemed to own the underlying assets. We are not aware of any conventional cooperative or mutual insurance vehicles that are, or could be adapted to be, shariah-compliant. Both family and general takaful are covered in the takaful market in Malaysia. Retakaful is common in practice, although ceding to conventional reinsurers is still prevalent owing to insufficient retakaful framework and infrastructure. Despite the fact that the Islamic finance industry is developing at a remarkable pace, the principal regulatory obstacle facing the Islamic finance industry in Malaysia is a lack of appreciation of the true nature and spirit of Islamic banking and finance transactions. Islamic banking and finance are often accused of being a mere replication of their conventional counterparts, and hence steered towards an objective that is more profit- and interest-driven rather than one that is aimed at serving the real needs of society. There appears to be a strong emphasis on ‘form over substance’, where the products and services offered are shariah-compliant on paper, but the pricing, treatment of late penalty and the interest-based benchmarks reflect those of conventional borrowing. We anticipate that over the next few years the BNM will continue to be heavily engaged in conversation with industry players to identify the loopholes in practices, and publish more guidelines and policy documents setting out the mandatory operational requirements and practices that Islamic financial institutions should adopt, in ensuring end-to-end compliance with shariah principles. The Islamic finance industry in Malaysia is supported by a comprehensive legal and regulatory framework as well as a robust infrastructure. However, to ensure that Islamic finance is able to compete with its conventional counterparts and that Malaysia is able to create an interest-free banking system, there is an urgent need to invest time and money in providing the essential training to develop a pool of human talent who can spearhead the government’s initiative in promoting Malaysia as an international Islamic finance hub. We are not aware of any notable conflicts between the accounting standards adopted in Malaysia and shariah principles. Based on Malaysia’s Federal Constitution, Islamic finance (contractual) matters fall within the ambit of federal laws and are dealt with by the civil courts. Generally, an Islamic finance contract is governed by civil laws and made subject to shariah principles. Civil court judges are bound to apply civil laws (being the laws of the land) in adjudicating Islamic finance disputes, and any issues concerning a shariah matter that arise from such disputes may be referred by the courts to the SAC for a ruling that is binding on such courts. This clear separation of jurisdiction minimises any potential conflict between shariah and local laws that are relevant to the finance sector. We are not aware of any special consideration for the takeover of an Islamic financial institution, outside the requirement of the general merger control regime. Any takeover of an Islamic financial institution is subject to the prior approval of BNM. The first green sukuk in the world was launched in Malaysia on 27 June 2017. The sukuk issued was classified as a green Islamic bond, as the proceeds were used to fund an environmentally sustainable infrastructure project (ie, the construction of renewable energy generation facilities). This innovative channel was originated to address global funding gaps in green financing and introduced by the SC under the sustainable and responsible investment (SRI) sukuk framework, which forms part of the Lodge and Launch Framework. The SRI framework is the result of collaboration between the SC, the BNM and the World Bank Group, in an effort to develop an ecosystem to facilitate the growth of green sukuk and to introduce innovative financial instruments to tackle global infrastructure needs and green financing. Several incentives are in place to attract green issuers including tax deductions until 2020, the year of assessment on issuance costs of SRI sukuk approved or authorised by or lodged with the SC, tax incentives for green technology activities in energy, transport, building waste management and supporting services activities. In April 2016, the SC introduced the P2P financing platform to widen the funding avenues for small and medium-sized enterprises. The regulatory framework, the registration requirements and the obligations of a P2P operator are set out in the Guidelines on Recognised Markets issued by the SC. Based on the guidelines, a P2P platform is defined as an electronic platform that facilitates directly or indirectly the issuance, execution or offering of an investment note or an Islamic investment note. All P2P operators must be locally incorporated and have a minimum paid-up capital of 5 million Malaysian ringgit. Where an Islamic investment note is offered through the P2P platform, the P2P operator must establish and maintain a shariah-compliant trust account into which all funds raised for the issuers must be deposited. To ensure that the Islamic investment note issued complies with shariah requirements, the P2P operator is required to appoint a shariah adviser who must be registered with the SC. In November 2016 the SC announced six registered P2P operators, which were expected to be fully operational in 2017. The advances in financial technology (fintech) have led to improvements in customer value and experience and further enhance the efficiency of the risk management system of financial institutions. To ensure that the existing legal and regulatory framework is conducive to the deployment of fintech, the BNM has designated a ‘sandbox’ to deploy and test the fintech innovation in a live environment, within specified parameters and time frames. Fintech companies and financial institutions (including Islamic financial institutions) are encouraged to participate in the sandbox to test their product, service or solution that uses technological innovation in the provision of financial services. The Financial Technology Regulatory Sandbox Framework was issued and came into force on 18 October 2016, setting out an applicant’s eligibility criteria, the application requirements and the disclosure or submission of reports or information. With effect from 1 January 2017, financial technology companies participating in the sandbox have been exempted from the relevant licensing requirements prescribed under FSA for the purpose of carrying on the authorised business or registered business as specified by the BNM. In 2018 the BNM issued policy documents on the contracting concepts of qard and rahn. The BNM issued a policy document in February 2018 on qard, which is set to come into force on 31 July 2018. Based on the policy document, qard refers to a contract for lending money by a lender to a borrower where the latter is bound to repay an equivalent replacement amount to the lender. A qard contract is established when ownership of a sum of money belonging to the lender is transferred to the borrower and the borrower is obliged to repay the lender in full, where the subject matter in a qard contract must be fungible, deliverable and recognised by shariah. A qard contract must not contain any contractual benefit to the lender, which includes a pre-agreed periodic rebate (ibra) to the purchaser on the instalment of a deferred selling price which is linked to the qard contract from the purchaser to the seller, any form of incentives based on the binding promise (wa’ad mulzim) to a lender to enter into a qard contract, or hibah granted by the borrower to the lender in the form of cash, in kind or benefit that is conditional to the qard contract. A lender in a qard contract may impose a fee (ujrah) in exchange for providing identified services, benefits, facilities or privileges that are shariah-compliant. To further illustrate, a mark-up fee charged by operators of international payment card networks (eg, Visa and Mastercard) intended to cover foreign currency conversion costs, which is then imposed by Islamic banks in Malaysia for cross-border qard transactions, would be permissible as such fee does not contain any profit element. Qard or wadiah yad dhamanah (savings or deposits with guarantee) contracts are typically structured as Islamic deposit products, which include current accounts, saving accounts and treasury products offered by Islamic banks in Malaysia. BNM has provided a 24-month transition period for Islamic banks to review its legal documentation and marketing strategies to comply with this shariah requirement. The BNM issued a policy document in July 2018 on rahn, which is set to come into force in August 2019. Based on the policy document, rahn refers to a contract where a party, as pledgor (rahin) pledges assets (which may either be a physical asset used to carry shariah-compliant activities or a mixed financial asset) as collateral (marhun) to another party, a pledgee (murtahin) to fulfil an obligor’s liability or obligation (marhun bih) owing to the pledgee in the event of default of such obligor. The inherent nature of rahn is the assurance that the liability or obligation owed by the obligor to the pledgee will be fulfilled in the event of a default as agreed in the terms and conditions of rahn. The collateral, which must be owned either by the obligor, a third party or the obligor and a third party, shall be immediately possessed by the pledgee upon entering into a rahn contract. Collateral in a rahn contract would be held on trust (amanah) by the person who is in possession of such collateral. The pledgor does not have the right to revoke the rahn contract without the consent of the pledgee. A rahn contract may be arranged with murabahah, tawarruq or a bai al-inah contract, where the collateral is liquidated to recover payment or any outstanding debt amount arising from such contracts. In this respect, the contracting parties may agree to include a claim on any expenses directly related to the recovery of the outstanding debt payment from the collateral. 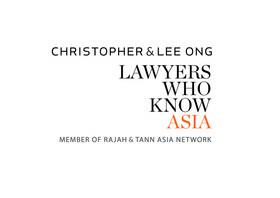 Based in KL Sentral, Christopher & Lee Ong is one of Malaysia’s respected law firms. We provide high quality advice to clients right across the commercial spectrum, with extensive experience in handling complex deals and disputes involving large local and multinational corporations, and governments and their agencies, as well as smaller local enterprises.